We have many different options when it comes to our sound and light kit. This allows us to put in a rig which is appropriate to the venue. Our kit is not old and battered, it is carefully flight cased and upgraded regularly. The sound system would be MacBook Pro, Denon midi-controller and mixing desk and Bose L1 providing sound for the suite for up to around 150 guests. 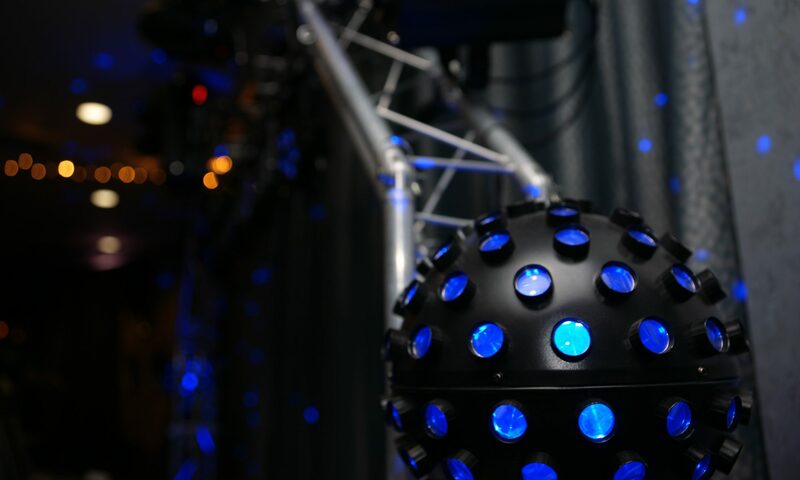 Two scanning LED spots or globe effects similar to mirror balls. Uplighters have become quite a popular add-on for people to use light to change the appearance of a venue by adding a splash of colour to theme a room. Later in the evening, once the disco starts they can be controlled to work alongside the other disco lights. There are so many options, like branding the DJ booth with the names and date for your wedding, to gobos projecting names and date onto the floor/walls or ceiling. We also have lasers controlled by computer using the ILDA system, which can display static or moving images and text. This is the modern way to display a theme message, way more modern and versatile than the gobo projectors of yesteryear. Want to brand the booth for your event? For very little cost, you can have the screen on the front of the booth branded for your event. If you can persuade your venue to let us use haze, it makes a big difference.